People who live in immigrant communities say that 287(g) brings the problem of racial profiling to their neighborhoods. Our analysis shows that 61 percent of jurisdictions that have entered into 287(g) agreements have crime rates that are lower than the national average. Census data show that 87 percent, however, are undergoing an increase in their Latino populations higher than the national average. Residing in the US without proper documentation is a civil immigration violation, but it is not a crime. Imagine if the IRS empowered local police to check the tax records of every person stopped for a traffic violation to see if their filings have ever violated civil tax laws. If the police started filling our jails with people who might have made a mistake on their tax filings, citizens would be outraged. Yet under 287(g), people are jailed when their civil immigration status is in question. 287(g) represents the fusion of two separate systems of law enforcement power. Once in place, it can lead to further entanglement of these powers as state and local politicians jump into the campaign to “crackdown” on immigrants. But civil immigration and criminal law are fundamentally incompatible. The grey area between civil and criminal law creates a situation ripe for abuse. The Constitution’s protections against arrest without probable cause, indefinite detention, trial without counsel, double jeopardy, and self-incrimination, as well as the statute of limitations, do not apply equally (or in some cases at all) in the civil immigration context. In Phoenix, Arizona, efforts to combine civil immigration and criminal law enforcement have wreaked havoc in the courts and overburdened the local criminal justice system. Under a state law that denies bail to immigrants for most crimes, judicial officers who were neutral arbiters in the court’s criminal process have become investigators of possible immigration violations. The first state-level trafficking law in US history has been used to target the victims of trafficking, as prosecutors charge them with conspiring to smuggle themselves across the border from Mexico. The over-burdened courts and jails have swelled with immigrants who are in no sense a danger to public safety. 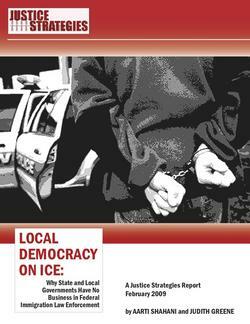 287(g) provides no money to pay local police salaries, and it shifts immigrant detention costs to local governments. Counties that sign up for the program have found that costs skyrocket. Prince William County, Virginia spent $5 million more in local tax monies than anticipated for the first year of its 287(g) program. The county had to raise property taxes and cut police and fire safety budgets to compensate. While the economic downturn has hamstrung state and regional governments, this is an additional cost that they cannot afford. The statute requires that ICE officers “supervise and direct” all local police partners, but in practice this does not happen. Poor training and lack of oversight means that local authorities are not equipped to deal with the complexities associated with civil immigration law. Local politicians are using 287(g) as an opportunity to raise their political profiles as tough on crime and restrictionist on immigration policy. In Butler County, Ohio, ICE extended the powerful civil immigration search, arrest and detention authorities to the sheriff after he campaigned on an anti-immigrant platform. In Phoenix, ICE refuses to revoke the largest 287(g) agreement, with Sheriff Joe Arpaio, despite charges of racial profiling and national criticism of his posse’s street sweeps of day laborers. Sheriff Arpaio promotes himself as the nation’s most prominent face of the 287(g) program, calling in the media to film the spectacle of thousands of detainees confined in his Tent City jail under the blazing desert sun. Meanwhile, in Berry Hill, Tennessee, a police officer arrested an immigrant driver in her last days of pregnancy, rather than issue her a routine traffic ticket. In jail, a 287(g) deputized officer issued a civil detainer to keep her locked up without bond. She went into labor while shackled to a jail hospital bed. Local police departments are paying out of pocket to participate in the federal government’s failed business of civil immigration enforcement. For this reason, many local government officials have rejected 287(g), leaving the feds to partner with more zealous and politically motivated officers. In this time of economic crisis, communities should just say no to 287(g), which places a tremendous financial burden on state and local taxpayers, without providing tangible public safety benefits. ICE Factsheet on the 287(g) program ICE is the largest investigative arm of Homeland Security. ICE explained in 2007 that 287(g) deputized officers gain “necessary resources and authority to pursue investigations relating to violent crimes, human smuggling, gang/organized crime activity, sexual-related offenses, narcotics smuggling and money laundering…The 287(g) program is not designed to allow state and local agencies to perform random street operations…It does not impact traffic offenses such as driving without a license unless the offense leads to an arrest.” ICE removed this language from its website in November 2008. Read the September 2007 fact sheet here. Operation Endgame In 2003, ICE Office of Detention and Removal issued a strategic plan. In “Operation Endgame,” ICE names partnership with local law enforcement as one of its primary strategies to build the capacity needed to achieve its goal to “remove all removable aliens.” Read ICE’s strategic plan here. Morris County Sheriff’s Office In 2008, the Morris County Sheriff’s Office (New Jersey) issued an impact review of the ICE 287(g) program. It estimated that to have the capacity to house sixty 287(g) civil detainees, the county would pay $1.3 million in personnel and facility start-up costs. Also, the report writes in boldface, “ICE would not reimburse the County for any start up costs such as those mentioned”. Download full PDF.